All the best photos from North Melbourne's Good Friday clash with Essendon at Marvel Stadium. Check out the best photos from Saturday night's win over the Adelaide Crows. The North Melbourne players hit the track for a final run on Friday, ahead of the clash against the Crows. Check out all the best photos from Friday evening's AFLW Best and Fairest night at River's Edge. Check out the best images from Sunday's clash with Hawthorn, courtesy of AFL Photos. Check out the best photos from Thursday's main training session at Arden Street Oval. The best photos from North Melbourne's Round 2 clash with Brisbane at Marvel Stadium. Check out the best photos from Saturday's clash with Port Adelaide at Alberton Oval. All the best photos from Saturday's JLT 1 match against St Kilda at Avalon Airport Oval. Wednesday's session was a last chance for players to stake their claim for selection in JLT 1. Six new Shinboners took to the training track on Monday morning, in what was a busy morning. 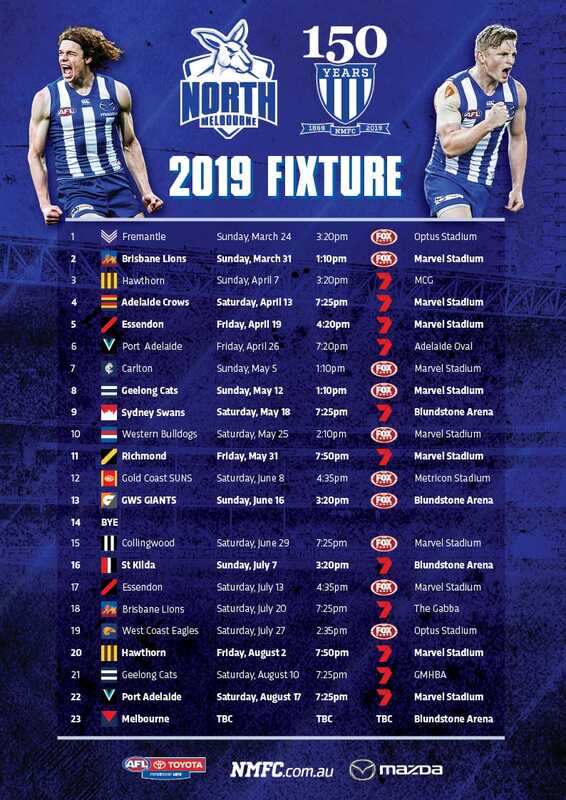 North Melbourne took to Arden St Oval on Monday morning for the first full session of the 2019 pre-season. The North Melbourne first to fourth year training group were joined by some new faces on Wednesday. North Media has taken a look back at some of the best images from the 2018 season. All the best photos from North Melbourne's win over St Kilda on Sunday at Etihad Stadium. All of the best photos from North Melbourne's Round 22 clash with the Adelaide Crows. The best photos from Sunday afternoon's match between North Melbourne and the Western Bulldogs.